Like most industries, the shipping and handling industry is getting more competitive and, in general, the world is moving at a faster pace. In smaller shipping and handling operations, timing and efficiency is a problem. Meanwhile, shipping industry magazines note that between the longer wait times due to heightened security and the sheer volume of goods being transported internationally that employees are finding less time to accomplish their tasks, including maintenance. On the other side, shipping companies are finding that from the pool of workers, many are not well trained. Some of these problems can be ameliorated by simply choosing a scale, like either the Arlyn Scales Series 3200 or Series 5200 scales, which feature a high-tech, yet durable water resistant console that makes weighing, saving and sending information as intuitive as using a smart phone. The scales are low-maintenance and do not require manufacturer setup. We designed an extremely easy, self-calibration system, which means you won’t have to put the scale out of commission to send it to the factory, like most scales. Arlyn Scales has been manufacturing their scales in the U.S.A. for over 30 years. We know exactly what your industry needs and have built easy-to-use and durable scales with that in mind. Don’t hesitate to tell us about your particular business at 800-645-4301 or write us here. We’ll find a scale to fit your needs and we can even outfit it with customizations in our factory to optimize your processes. View our Industrial Scales here and sort by Price, Popularity, Title, Manufacturer, Newest, Oldest and Availability. 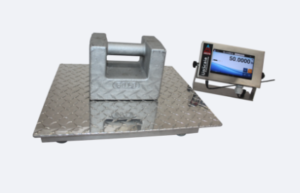 Our Series 3200 Platform Scales and our Series 5200 Floor Scales are our most popular scales for the shipping industry. For smaller operations, Arlyn Scales has several scales and many options that print United States Postal Service postage for your packages. Not all shipping scales on the market offer this feature. There is also software available that uses a standard digital shipping scale to calculate shipping for a variety of services. In this case, you should ensure to speak to the sales person to activate the best communication feature for your business, choosing from Ethernet, USB or WiFi.